Join Sian from Psyched Paddleboarding for a true relaxing and gentle SUP holiday, in clear turquoise water. 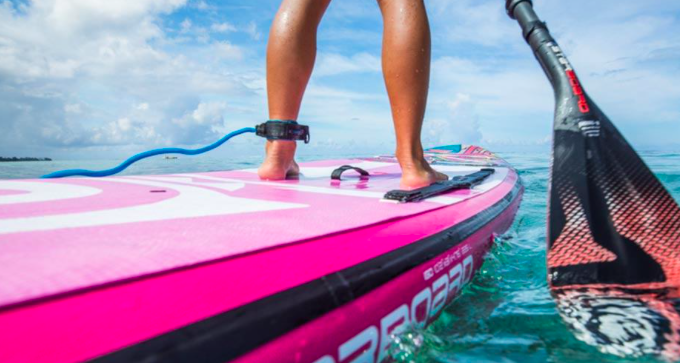 Enjoy paddling in a bikini or board shorts with sun on your face. Explore the amazing beautiful, quiet north coastline of Ibiza. The SUP Ibiza Holiday is a perfect break away with close friends or family or by yourself. Join us for a 4 night holiday away in the sun. A warm welcome awaits you at the charming, rustic and authentic 100 year old villa (finca in Spanish). As you approach the main house, first thing you see is stunning pink bougainvillaea, that covers our terrace area. This sets the style to the rest of the house, Sabina wood beams and large open fireplace in our living space ‘the heart of the house’ and our white washed walls with simple and comfortable furnishing. Deco is Nordic Ibizan chic with white washed walls, tiled floors, wood furnishing, and some holistic luxuries added in, including 100% linen (flax) bedding and organic pure natural plant based complimentary toiletries. Each room has air-conditioning. The villa has extensive gardens with fruit trees, a beautifully maintained grass lawn, Indonesian day beds for you to lounge in and it is set in two acres of woodlands. The large 12 x 6 meter swimming pool with terrace has plenty of sun beds and sunshine. The villa also has a vegetable garden next to an orchard with lemon and orange trees. The heart of the villa is a place for you to sit back, unwind, relax, also socialise, chat and laugh. The traditional Ibizan villa is located in area called Can Guasch, on the quiet outskirts of Santa Eulalia, with a short distance away from this quaint seaside town and its beautiful beach. The villa is about 20 minutes from Ibiza Airport. Wholesome and nourishing cuisine that is locally sourced, organic (or we rather call that naturally grown) and vegetarian meals. And there is plenty of food available, you will not go hungry. Think colourful, tasty, seasonal and nutritious ‘feasts’ cooked with love and intension to ensure you leave the mealtimes satisfied and well nurtured. The meals are enjoyed on the bougainvillea covered terrace that overlooks the gardens or on cooler nights we light the fireplace in the heart of the house and have dinner with open fire and candle light. You can fly directly to Ibiza from Liverpool, Manchester, Birmingham and London. Prices are currently from £150pp, however be quick! From experience we recommend hiring a car which can be shared between 2-3 people, perfect from the airport to the villa and to the paddling venue, so you can be left to your own devices to explore the island during down time. When booking flights please remember to add access baggage for 20kg. Psyched Paddleboarding can arrange board hire if required. Please make sure you have personal holiday insurance, valid passport and E111 card. Final balance payment is required 6 weeks prior.